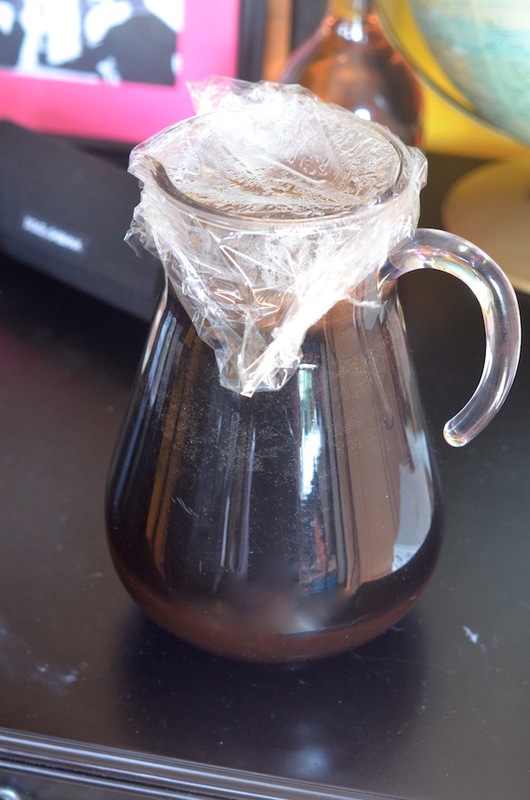 This past weekend I posted a few photos of my DIY cold brew concentrate on Instagram and Facebook, and got so many questions about it, that I decided to write up a quick post on it. Here's what you do. 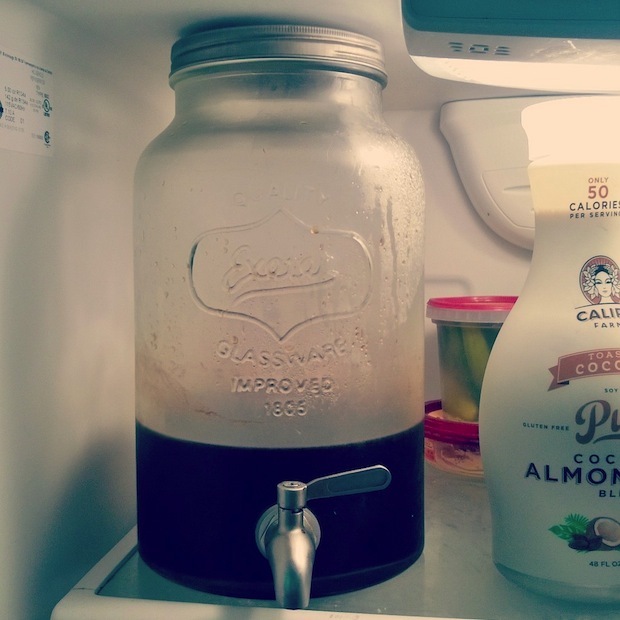 This recipe makes just slightly less than 1/2 gallon of cold brew concentrate, which is enough for about 12 or so large iced coffees, depending on how strong you like them. You can easily double the recipe if you want more (the concentrate keeps well in the fridge for a couple weeks, or it can be frozen). Start off with 1/4 lb of espresso ground coffee. Choose whatever kind you like (I've even done this with flavored coffee). Note that some will taste better than others, so play around until you find your favorite. 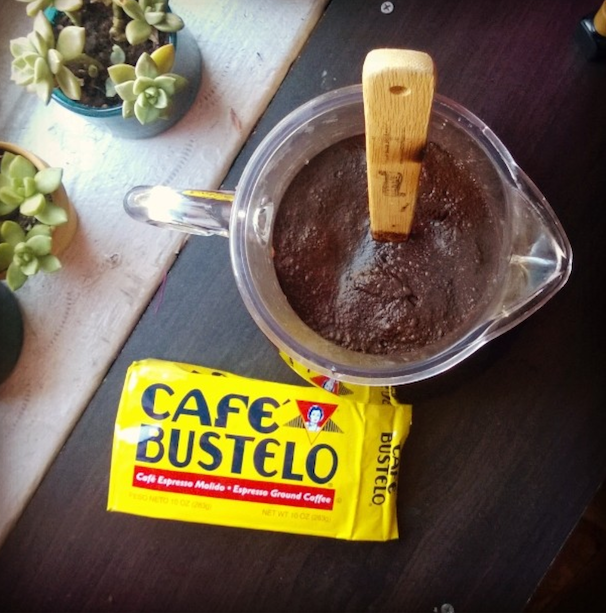 I'm a big fan of Bustelo, but I suspect that's a nostalgia thing for me. Combine the coffee and 1/2 gallon of cool filtered water (that's 8 cups) in a large container or pitcher. Give it a good stir and then cover with a cap or plastic wrap. Leave at room temperature for 8-10 hours. You don't want to go much more than that as it will get too strong and a bit bitter. I like 8 hours exactly. Strain the coffee through a cheesecloth set over a fine mesh sieve. This part takes a while, but it's key to avoid grainy coffee. You can also use a French press to strain out the coffee grinds. Note that I don't have photos of this step because it's messy, and I needed both hands. Once strained, transfer to a large seal-able container, and store in the refrigerator. I store mine in a large beverage dispenser with a spigot, for easy pouring. Fill a glass to the top with ice. 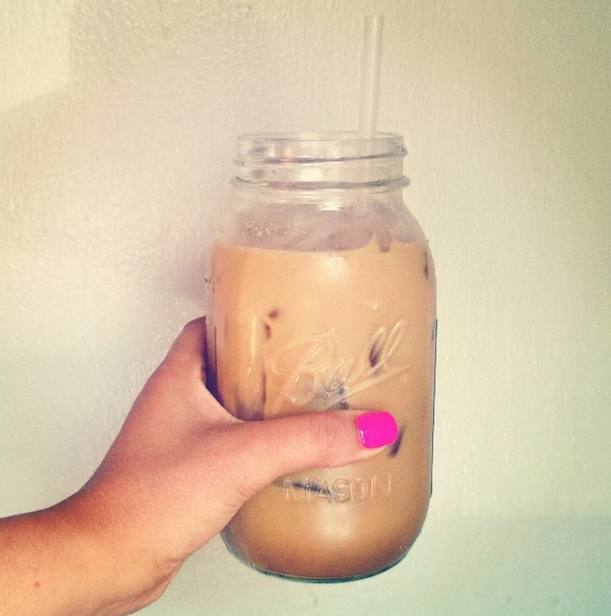 Pour in cold brew concentrate until it reaches halfway up the ice-filled glass. If you're adding sweetener, add it now. Note that simple syrup works best here since it will dissolve easily. Now, add water until it almost hits the top, saving room for milk or cream. Add milk or cream. Give it a little stir, and drink! I like to add a little vanilla extract and ground cinnamon to my coffee before I add the water. It's delicious! I hear that condensed milk is also awesome in this, although I've never tried it myself. Note that depending on how strong or weak you like your coffee, you should add more or less water or coffee concentrate. Play around until you find what works best for you! Combine coffee and water in a large container and let steep at room temperature for 8 hours. Strain through a cheesecloth-lined mesh sieve, and chill. 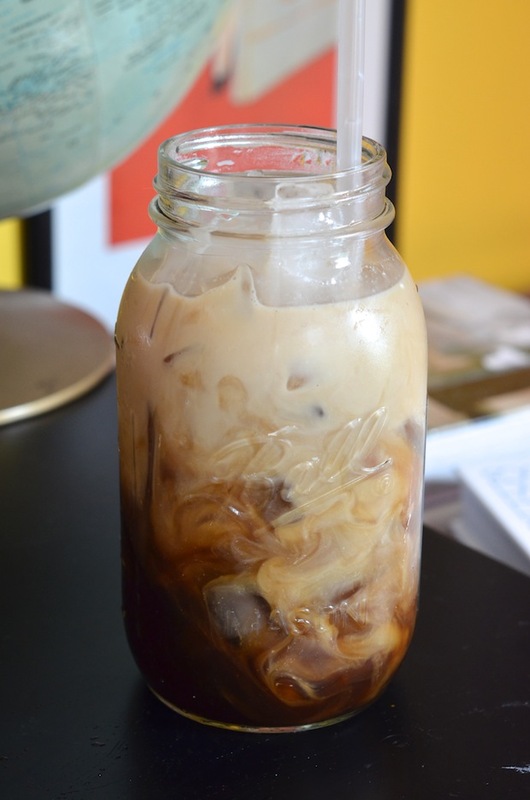 Follow directions above to prepare iced coffee.